Earlier this month, Marvel confirmed that Thor: Ragnarok will start production on July 4, with the studio already setting a November 3, 2017 release date. Over the past few weeks, new cast members and plot details have surfaced, but today, we have our first look at one of the sets being built for this Phase 3 sequel. While we don't know exactly what this building is, it certainly appears to be one of the Asgardian dwellings. Gold Coast Bulletin reveals that several outdoor sets are being built at Village Roadshow Studios in Oxenford, Australia. While none of the cast members are present, since filming hasn't begun yet, that will surely change in the weeks ahead. Hopefully we'll also get the first official story details when shooting starts, to combat the numerous rumors that have sprung up as of late. One of the most prevalent rumors is that the new villain Hela will team up with Loki and banish Thor from Asgard, destroying his mighty hammer Mjolnir in the process. Thor then goes on a journey that leads him to a planet full of gladiators, where he is forced to go up against the current champion, Hulk (Mark Ruffalo). This eventually leads to a "cosmic road trip" between Hulk and Thor, but none of those details have been confirmed. Marvel Studios president Kevin Feige has teased that Thor: Ragnarok will largely be set in the cosmos, with very little time spent on Earth. Taika Waititi, whose new movie The Hunt For the Wilderpeople opens in limited release this weekend, directs from a script by Christopher Yost, Craig Kyle and Stephany Folsom. 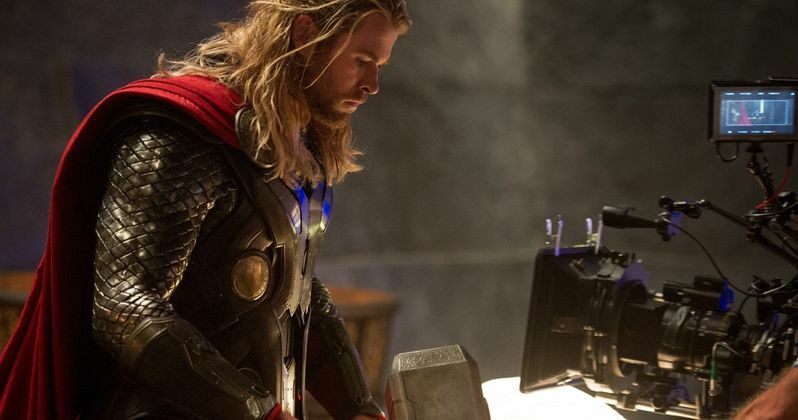 Take a look at these new photos from the set of Thor: Ragnarok below, and stay tuned for more details as we get closer to principal photography getting started.